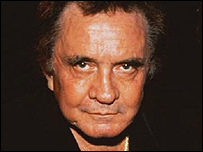 Country legend Johnny Cash has been shortlisted for three Mojo awards, two years after his death. The Ring of Fire singer is nominated for the icon and inspiration awards, while a box-set of his recordings is up for best catalogue release. The Mojo Honours List aims to reward artists for a body of work instead of focusing on current favourites. "It is not about the biggest names or the hottest acts," said the magazine's editor-in-chief Phil Alexander. "The event was created to recognise those artists that have enriched our rich musical culture and that's what it continues to do." The inspiration award, which went to rock band Gang of Four last year, will see Cash competing with Paul Weller, The Fall, Buzzcocks and Sparks. For the magazine's top honour, the Mojo Icon award, he is up against Neil Young, Van Morrison, Scott Walker and David Bowie. This is Bowie's third consecutive nomination in the icon category. He was beaten to the title last year by punk singer Siouxsie Sioux. At the time, Sioux complained about the lack of women in the awards. "I'm the token female winner," she said. "I think we need a few more women up here." This year's list is again dominated by male artists, although Kate Bush and Chrissie Hynde both receive nominations for the songwriter award. Corrine Bailey Rae, who won the BBC News website's Sound of 2006 survey, is also in competition for the best new act award. The winners will be announced at a ceremony in Shoreditch Town Hall, London, on 5 June.